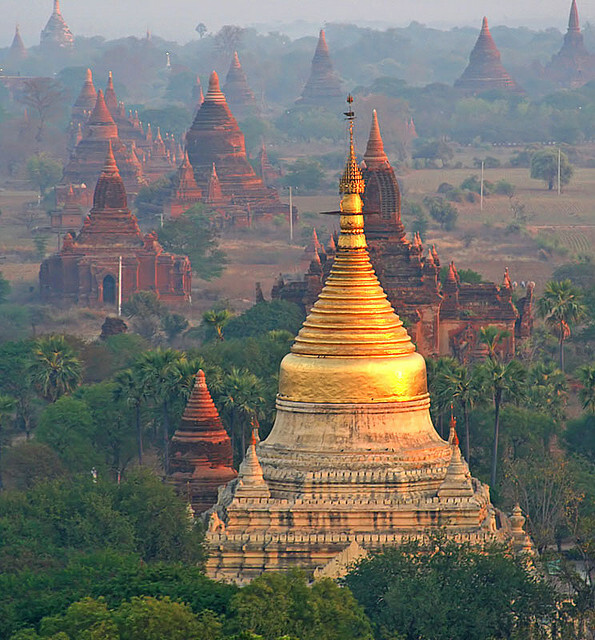 If you could only see one temple in Myanmar it should be the Shwe Dagon Pagoda (also called Shwedagon Paya, Golden Pagoda, Great Pagoda, Shwedagon Zedi Daw and Shwedagon Pagoda). Shwedagon Pagoda is thought to date back to the 6th-10th century but legend has it that the structure is about 2,500 years old. An inscription, dated 1485 is written on the eastern stairway telling the story of the Shwedagon in Pali, Mon and the Burmese languages. The building suffered damage from several earthquakes over the years and the version we see today was constructed in 1769 under King Hsinbyushin. In 1871 a new hti (the decorative top) was added. 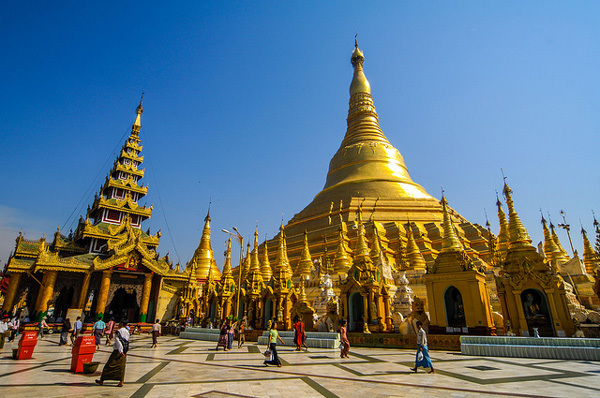 The structure has not only religious significance but during the struggle for independence the pagoda was the site of political demonstrations, gatherings and it was a symbol of the nations struggle. Later once independence was gained the site continued to be used for national celebrations. The pagoda itself has a 432.81 meter perimeter; is 98 meters high and stands on Singuttara Hill which is 50 meters above the city which lives in the monument’s shadow. The huge structure demonstrates refined artistic skill in the decoration and architecture. Visitors approach from four entrances, if you approach from the southern entrance you’ll see two 5.5 meter high chinthe (lion-dragons). Around the base of the pagoda are 60 small pagodas with larger ones at each corner and at each point of the compass. The main stupa is on a raised plinth surrounded by a 6 meter wide terrace and the surrounding other stupa are on lower levels. The main stupa is made of solid brick completely covered in gold and the upper section is studded with diamonds. One of the many stunning features is the hti, or spire, which has 7 iron tiers covered in gold and decorated with gold and silver bells as well as precious stones. The flag attached to the highest spire has 1100 diamonds and 1383 other precious stones. A diamond orb tops off the spire with further 4351 diamonds and the crowning glory is the 76 carat diamond which balances on the tip of the spire. Within the pagoda complex are a number of prayer halls, shrines and stupas including the Bell Pavilion with the 23 ton Maha Ganda Bell; the 9 meter high Buddha and two banyan trees grown from cuttings taken from the Bodhi tree in India where Buddha was enlightened. This is the holiest of the Buddhist temples in the country as the stupa holds the relics of four Buddhas. The relics include the staff of Kakusandha, the water filter of Konagamana, part of Kassapa’s robe and 8 strands of Guatama’s hair. 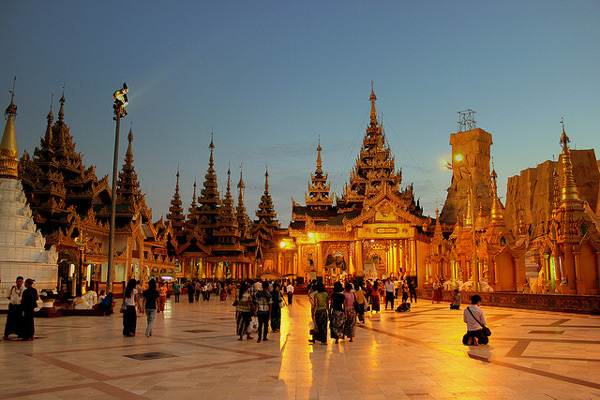 To visit the Shwedagon Pagoda go to Number 1 Shwedagon Pagoda Road, Dagon Township, Yangon, Myanmar. Previous ArticleGo Crush a Car At Tank Town, USA!